Nathan Chen performs during the men’s free skate event at the U.S. Figure Skating Championships in January. Crank up a standard ceiling fan to maximum speed. Peek through the window of a CD player as the disc starts spinning. Chen, 18, is representing the United States in the Olympic men's figure skating competition in Pyeongchang, along with Adam Rippon and Vincent Zhou. He had a subpar performance in the initial team event last week, but he and his teammates are back on the ice Thursday for the men's short program, airing on NBC. All three can land quadruple jumps, a blur of motion that has been a staple of elite men's skating for years — requiring the athlete to complete four midair revolutions in less than one second. But Chen, styled as "King Quad" in a recent airline commercial, whirls through the air like none other. 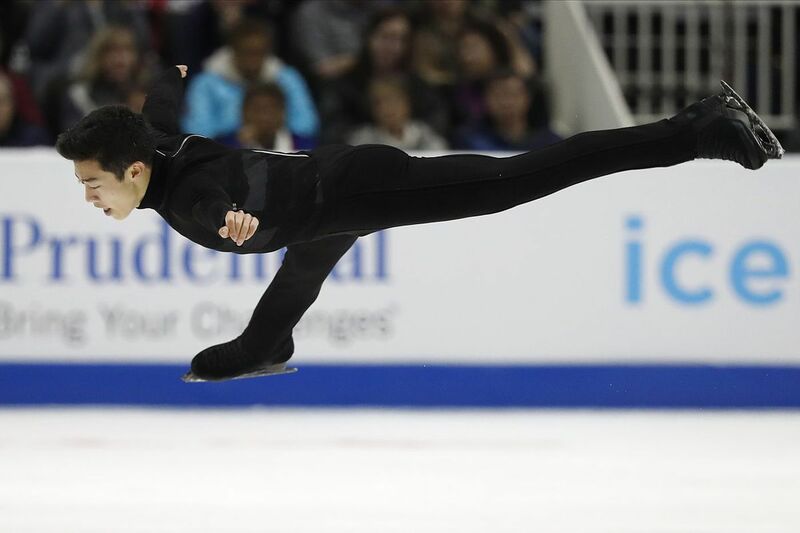 At the national championships in January, his long program included an eye-popping five quads — for the second year in a row. At the peak of each jump, Chen is spinning at a rate of well above 300 revolutions per minute, though he is in the air for just three-quarters of a second. The secret lies in how he and the other quad-jumpers harness their kinetic energy, says Jim Richards, a professor of biomechanics at the University of Delaware. Approaching the jump, the skater accelerates to a speed close to 20 miles per hour, then drives himself into the air with a powerful kick to the ice. But not too high — or else not enough momentum is translated into the spinning motion, said Richards, a member of Delaware's department of kinesiology and applied physiology. "There's a compromise between how high they're going to go and how fast they're going to spin," he said. The arms are a key part of the equation, Richards added. Imagine trying to jump as high as possible from standing still on the ground. You would swing your arms together in an upward arc to help propel your body upward. Now imagine trying to jump up while simultaneously spinning in midair. Instinctively, you would swing your arms around your body in more of a circular motion while jumping. Not as much height, but presto! Midair rotation. Nathan Chen does more or less the same thing with his arms as he prepares to jump, except he has honed that motion to perfection with years of practice. Then, once in the air, he needs exquisite body control to spin four times before landing. And subjecting the body to this extreme rate of rotation is not natural behavior. That's where experts like Richards come in. Though he has not worked with Chen, the Delaware researcher has helped other members of this year's team, using sophisticated motion-capture software to create an "avatar" of each skater. He then runs a simulated animation on his computer screen to demonstrate how many rotations can be achieved when holding the arms, torso, and other body parts in a certain way. Here's the main principle: the closer the skater draws his or her body in to the center, the faster the spin. Yet if the skater extends an elbow or forearm out from the central axis of rotation, that means a slower spin. It is what physicists call having a higher "moment of inertia" — meaning more of the person's mass is located away from the center. Watching a video of Chen performing a quad, Richards spoke admiringly. "He's able to get himself almost into what I would describe as a straight line," Richards said. "Almost no space between his legs. His arms are right against his side. And he's symmetrical." Are such high rates of rotation bad for the skater's health? No, said David Wang, clinical director of Elite Sports Medicine, a division of the orthopedics department at Connecticut Children's Medical Center. In a quadruple jump, the skater's head is located right on the axis of rotation — as steady as the head of a spinning top — and is not subject to any sorts of sudden deceleration that could cause brain injury, he said. A skater might experience dizziness, however, after performing a layback — a spin in which the skater remains on the ice, arched backward with the head held far from the center of rotation. Skaters who practice such spins for hours on end may even get little red dots on the forehead or bloody noses, Wang said. "Like a centrifuge, you're taking blood and you're sort of forcing it out to the periphery," the physician said. Blood flow returns to normal when the skater stops spinning. Yet Wang studied one famous spinner, former Swiss national champion Lucinda Ruh, who suffered long-term dizziness and memory loss. The exact reason remains unclear. The forces that she experienced from extensive spinning were not close to the level that would cause a concussion, but she might have suffered symptoms due to the cumulative effect of many hours at lower levels of force, the doctor said. Her dizziness may also have been due to the disruption of her vestibular system — her sense of balance, Wang said. The greater risk from figure skating is injury to the bones and joints, Wang and Richards agreed. Ice is a hard surface, and the skaters land on it over and over again, with unforgiving "boots" on their feet. "The boots aren't designed to absorb impact," Richards said. "They're rigid in all directions." Yet again and again, these athletes whirl through the air and land with grace. And at the Olympics, "King Quad" plans to spin the most of all. Staff writer Ellen Dunkel contributed to this article.